Mactan Island is located only about 3kms from Cebu Island, and is part of Cebu province. The Island is only 65sqm, but has a population of nearly half a million people. This makes it the country’s most densely populated island. Despite all this, Mactan Island is the most popular tourist destination in Cebu, and arguably the Visayas region, due to its close proximity to Cebu City and its raw, natural beauty. It is also rich in history with the Spanish colonizing the island as early as 1521. 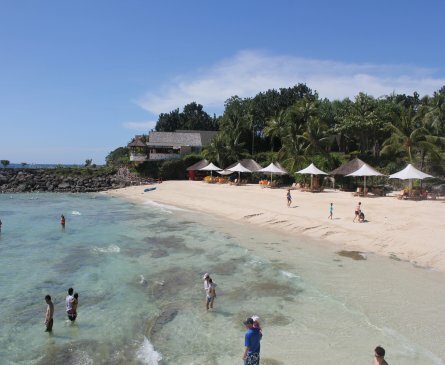 Aside from certain historical events, Mactan Island’s main claim to fame is the Shangri-La’s Mactan Resort and Spa, and Plantation Bay, both arguably the two best resorts not just in Cebu, but the whole of the Philippines. Aside from the several exclusive resorts on Mactan Island, there really isn’t much to the place. It is most notably an industrial area due to its tax-free status, with tourism being the other main economic contributor to the island. I have been fortunate enough to stay at the Shangri-La and also the Imperial Palace Waterpark. 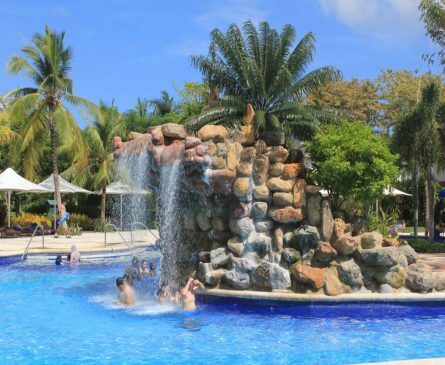 The Imperial Palace Waterpark is a fantastic place for families. It is basically a giant waterpark, featuring wave pools, swimming pools, water slides, beachfront, and my favorite part, a pool bar. However, you can’t beat the Shangri-La. In terms of being a water park, the Shangri-La doesn’t really compare to the Imperial. However, in terms of beauty, be prepared to be spellbound by this sensational resort. 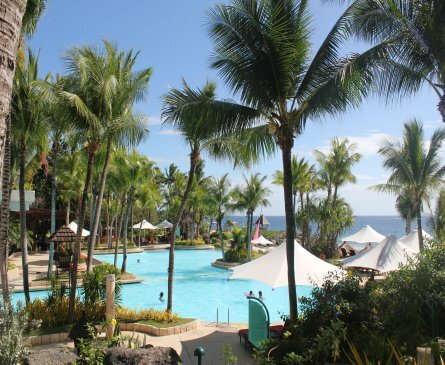 With its own exclusive white sand beach front, right through to its massive palm tree lined swimming pools, there isn’t too many more beautiful resorts than this in the Philippines. An aerial view of the pool at Imperial Palace Waterpark. The pool bar to the left of pic was of particular interest to me! 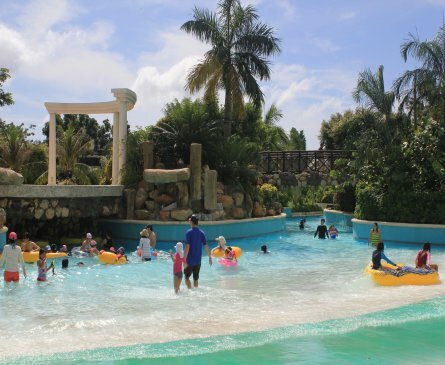 The wave pool is very popular with families – kids love it! There was also a nice little waterfall area in the shade. This provided me with some relief from the scorching sun. The adult pool Imperial Palace Waterpark was sensational also featuring a refreshing waterfall in the middle. The exclusive beach front at Shangri-La. A small and very safe beach to enjoy with the family. I honestly don’t think I have seen a bigger swimming pool than this one at the Shangri-La – there must be about six pools in one! This photo doesn’t do it justice, but pool/s go on as far as the eye can see. 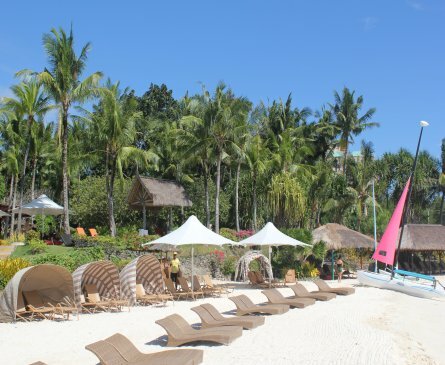 The exclusive white sand beach at the Shangri-La is absolutely sensational. Sitting here with a lunchtime cocktail is something I will never forget (or won’t remember!). Philippine Airlines (PAL) fly to Cebu from Manila ten times daily and the flight takes about one hour. The airport is actually on Mactan Island, so to get to any of the resorts from the airport will only take 10-15mins via taxi or van for less than P200. 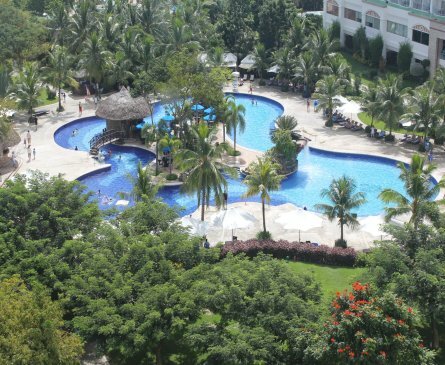 As mentioned, there isn’t really much to Mactan Island aside from its resorts so if you have the budget for it, my recommendation would be to go down on a Friday and come back on the Sunday, and don’t do anything else aside from chilling at the resort!